Shopping for new carpeting for your home? A beautiful and plush material, carpet flooring is an ideal choice to outfit your home. Whether you want to add ambiance to a room or give the entire home a different look, our reputable carpet store has numerous materials to choose from. If you want to shop the best home carpeting in the area, we have it all. Our stunning collections include high-quality materials at a variety of price points. Always a popular flooring option, many customers select carpeting for its inherent warmth and style. Add instant comfort to a room, whether it’s a den, living room, or bedroom. You will also find the softness of carpet is a nice addition to the environment of your home, offering children a soft area to play and everyone a nice space to relax. An ideal sound barrier, this flooring also helps cover up noise that passes throughout the home. Pick from all sorts of patterns, textures and colors to go with the style and décor of your home. At our floor showroom, we are experts at helping you pick the perfect flooring for your home. Stop by our carpet store to try out our comfortable and wide range of carpet flooring. We are happy to guide you every step of the way—from selection to installation. Looking to upgrade your outdated carpets? 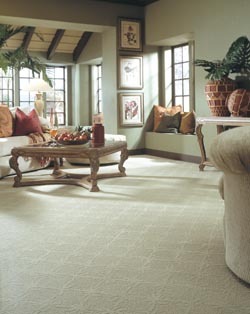 Berber carpets are an ideal choice for virtually any interior design or color scheme. With a huge variety of colors and patterns to choose from, you’re certain to find the perfect Berber carpet to beautify your home. In addition to creating a more cozy and inviting environment in any room, adding these carpets to your home is a great, inexpensive way to increase your property’s value when you’re ready to sell. Whether you decide to go with olefin, polyester, or luxurious wool, Berber is famously durable and long-lasting. In addition to all-around durability, these carpets are also spill-resistant, making it a simple matter of soaking up any spills and treating the spot with spot-remover. The strength, ease of care, and versatility of color and pattern in Berber carpets make them a wonderful addition to any room in your house. Take care of your carpet floors and they will retain their plush feel and resplendent appearance for many years to come. Caring for your carpeting is easy when you know how. If you have any questions about carpet care, turn to the flooring professionals at our carpet stores who have in-depth knowledge on all the different types of carpeting and the various ways to keep them in beautiful condition. One of the easiest ways to maintain your carpet flooring is by vacuuming it on a regular basis, at least once a week. This prevents the buildup of dirt and debris that damage the fibers. Make sure you take your time when vacuuming in order to remove the gritty particles located deep down in the carpeting. Removing carpet stains requires a more in-depth approach. If the stain is fresh, you should immediately apply a spot-remover chemical and allow it to sit for the amount of time recommended by the product manufacturer. You can then use a cloth or paper towel to press down on the spot, allowing the material to soak up the stain. Do not rub or brush the stain vigorously, as this can push the stain further down into the carpet fibers. For old stains, you may need to use a specialized wet-vacuum or hire professional cleaners. Keeping your carpets in good condition is an easy way to maintain the appearance of your home. It also ensures the texture stays nice and soft, so your carpet always provides you with a comfortable place to walk, sit, or lie down. Now that you have purchased your flooring, schedule your carpet installation with our experienced and skilled installers. The quality of your new floor installation is every bit as important as the quality of the materials you buy. Our professional specialists will ensure your new investment is installed properly so it looks great and feels comfortable for many years to come. In addition, we offer the industry’s best warranties so you can feel completely confident about your purchase. Are you searching for a carpet store with the best deals on high-end carpeting? Consider your search over, because we have unbeatable prices on the most trusted carpet brands, including Stainmaster™, Tigressa™, and Resista™. These luxury carpet brands are known for their comfort, resilience, and beauty. They utilize the latest polyester technology to create carpet fibers that are both durable and soft to the touch. This makes them ideal for a wide range of applications, from bedrooms and dens where comfort comes first, to hallways and living rooms that receive high amounts of foot traffic. One of the most recognizable names in the carpet industry, Stainmaster carpets offer style, comfort, and cutting-edge manufacturing technology that keeps carpets up to 30% cleaner by repelling spills and soil. With Stainmaster carpets, you know you always get reliable, high-quality carpet flooring that increases the beauty, cleanliness, and value of any room in your home. Tigressa carpets are well-known for their luxurious softness at prices almost anyone can afford. In a wide variety of color schemes, densities, and textures, Tigressa offers a type of carpeting to fit any need or budget. Best of all, Tigressa carpets are manufactured using eco-friendly fibers and processes, so you’re helping the Earth while you improve your home. Make any room more inviting with the perfect combination of comfort and strength in Resista brand carpet flooring. Featuring a revolutionary 10-year no exclusion warranty against food and beverage stains, Resista carpets are an excellent choice for families with children or pets. These carpets are also excellent for high-traffic areas like hallways and entryways, because they hide signs of foot traffic and resist regular wear and tear. Once you choose the type of carpeting that suits your practical and aesthetic purposes, you can further customize the color and patterns to create a one-of-a-kind look for your home. Increase your real estate’s value with brand-new carpeting in one room or the entire house, or treat yourself and your guests to comfortable new flooring. Contact us for more information about the carpet flooring products we have to offer. We proudly serve the communities of Fort Dodge, Webster City, Humboldt, Eagle Grove, Clarion, Algona, Rockwell City and Storm Lake, Iowa.